The Massanutten Ridge Trail is part of the network of trails on resort property. 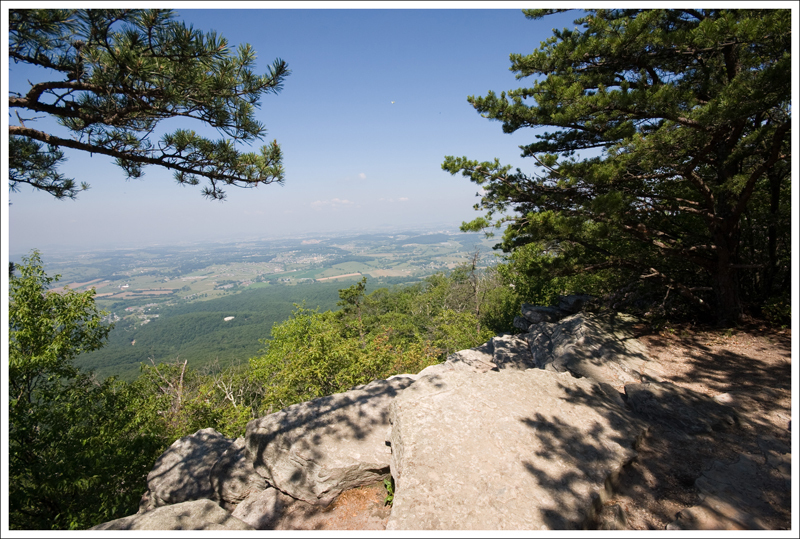 This hike departs from the overlook at the top of Del Webb Dr. in Massanutten Resort. The hike is extremely rocky, but offers superb views from an outcropping above the ski lifts. 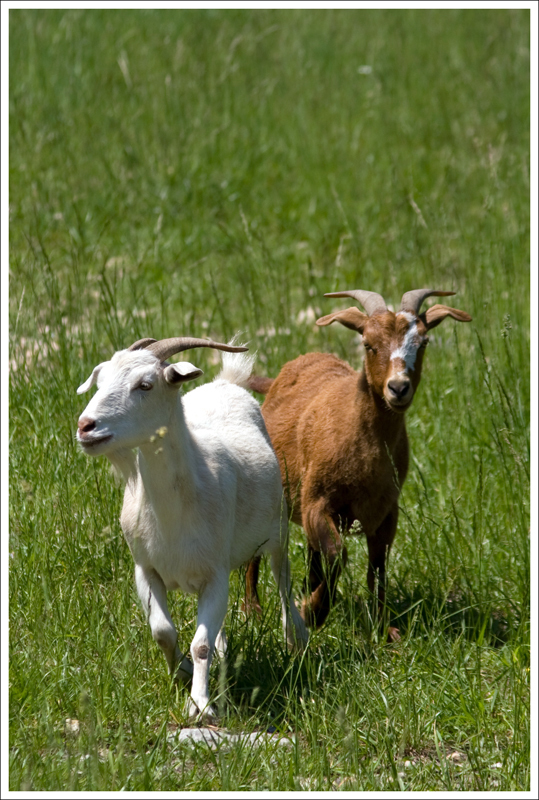 The friendly goats were the highlight of the Massanutten Ridge Trail. 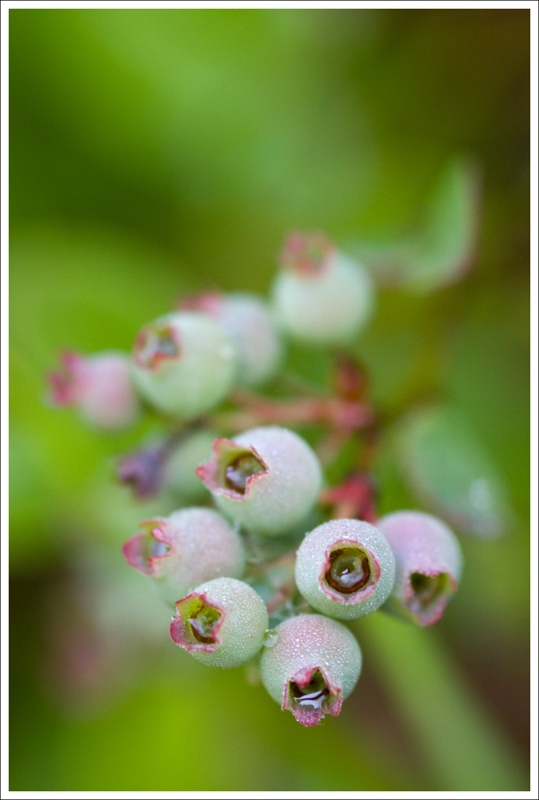 Below: The hike also provided beautiful views of the valley below; blueberries (not ripe yet) were abundant along the trail; The goats used us like human salt licks; When we tried to walk on, the goat chased us down the mountain. If I could have a movie made about this hike it would be called “The Men Who Are Licked by Goats”. Who would have thought that there would be feral goats on the top of Massanutten? An online hiking group I had joined, Valley Hikers, completed the Massanutten Ridge Trail Hike recently, but I was unable to attend. While we have been up to the beginning of this trail before, we hadn’t completed the entire hike before. We recently did the Kaylor Knob hike, so we thought we would also take care of the other hike from the top of the Massanutten overlook. We parked one car at the Massanutten General Store near the ski slopes and then drove to start our hike at the overlook at the top of Del Webb Drive. At the parking lot, you are treated to views of the ski slopes and mountains around. You start the trail by climbing up a staircase to get to the level ridge. The blue-blazed trail starts with a fairly well-trodden wide path. There are spots along the way to peak through to see some views along the first .25 mile. Around the .5 mile marker, the trail becomes much rockier. You will need to constantly look where your feet are stepping or you could easily sprain an ankle. 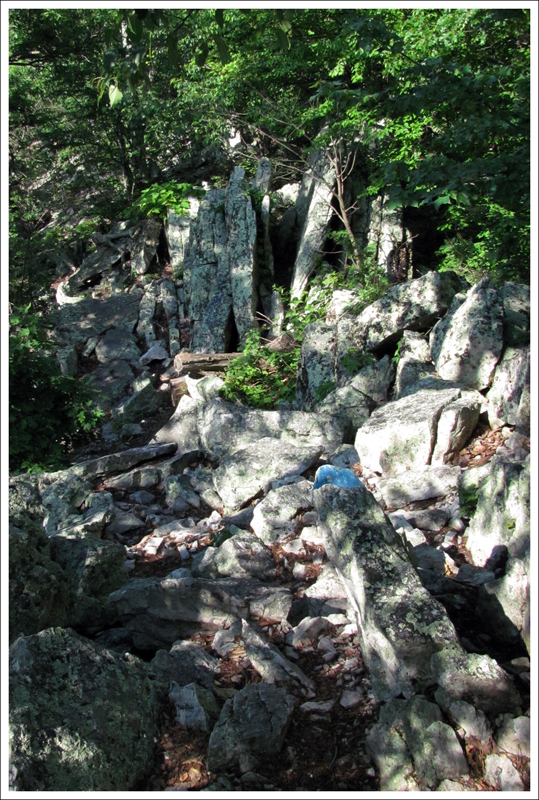 This rocky, difficult portion continues for about 1.5 miles. At mile 1.25 on the trail, you come to a nice overlook on the right side of the trail to see some views to the North. At 2.25 miles, the trail eventually joins a gravel road. You will see some blue blazes directly across the road, but there is not a trail there. Simply take a right at this junction and climb the gravel road to reach the cellphone towers at the top. The trail picks back up just to the right of the highest cellphone tower. 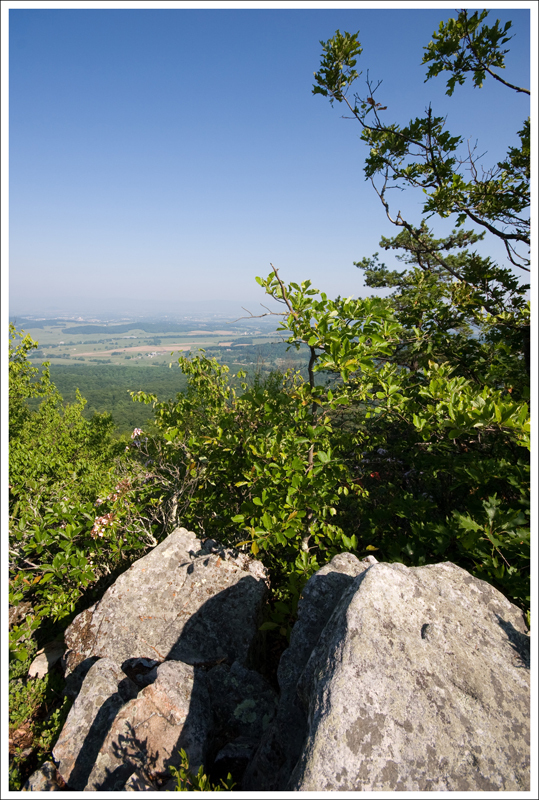 As soon as you rejoin this trail, you will come to the best views on the trail at some rocky overlooks. At mile 3.0, you will also see a hang-gliding ramp. It is insane to think of people just running and jumping off of this. To your left, you will be able to see the ski lift drop-off for the top of the Diamond Jim and ParaDice ski trails. During the ski season, the lift area is blocked off (maybe to keep people from illegally jumping on the ski trails). There was a rope blocking it off still, but the cordoned area does not completely block access to the trail. Continuing past the hang-gliding area, the trail continues and you start your descent. At mile 3.25, the trail leads to an opportunity to walk down the ski slope. You could continue further on the actual trail, but we were unsure how close it would return us to our car. We jumped on to the slopes to take a steep descent back to our car at 4.0 miles. During this last .75 miles, you descend about 1000 feet of elevation. I highly recommend taking trekking poles to help keep your balance as you navigate the steep terrain. 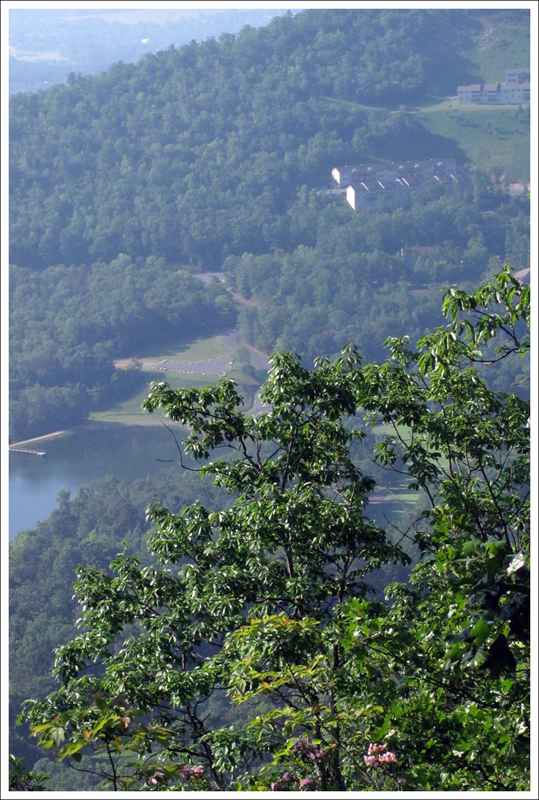 The hike followed the ridge and provided many views of Massanutten Resort and the valley on both the eastern and western sides. Below: The middle two miles of the hike was extremely rocky and required quite a bit of rock scrambling; A view of a pond at Massanutten resort; Eastern Fence Lizards in a mating dance; We even stumbled across a Box Turtle on the trail. The highlight of the trip definitely had to be the goats that we saw at the top of the ski slopes. As soon as they saw us, they came running toward us to lick the sweat off of us. 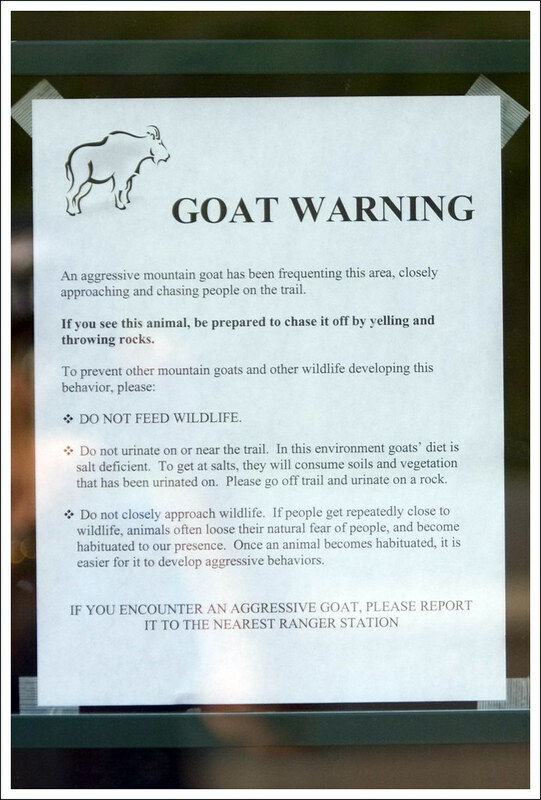 It reminded me of a sign that we saw during our trip to Olympic National Park, warning us not to urinate in public or goats would come. They love salt and were quite eager to lick the salt off of us. So, beware if you are not into that thing, but I thought it was funny. The goats were extremely friendly and followed us around for a while at the higher elevations. This hike was tough due to the trail conditions, but it was great to see the views and the wildlife on the trail. I had art shows to work over the weekend, so we needed to find a short hike that was located really close to our home. The Massanutten Ridge Trail seemed to perfectly suit our needs. I thought the hike would be a piece of cake because the ridgeline has very little elevation change overall. So, I was rather surprised to find that it was a real hike with challenging terrain. The middle section had a lot of tricky footing and rock scrambling. It was a constant up-and-down, resembling a small scale roller coaster. Normally, it would be the type of terrain I really enjoy, but I was fighting off a cold all weekend. My stuffiness and fatigue made this squarely moderate hike feel a lot tougher than it typically would. There were definitely a few scrambles where I would have been happy to hang-glide right off the side of the mountain just to avoid climbing over anymore rocks! The Goats were fun! 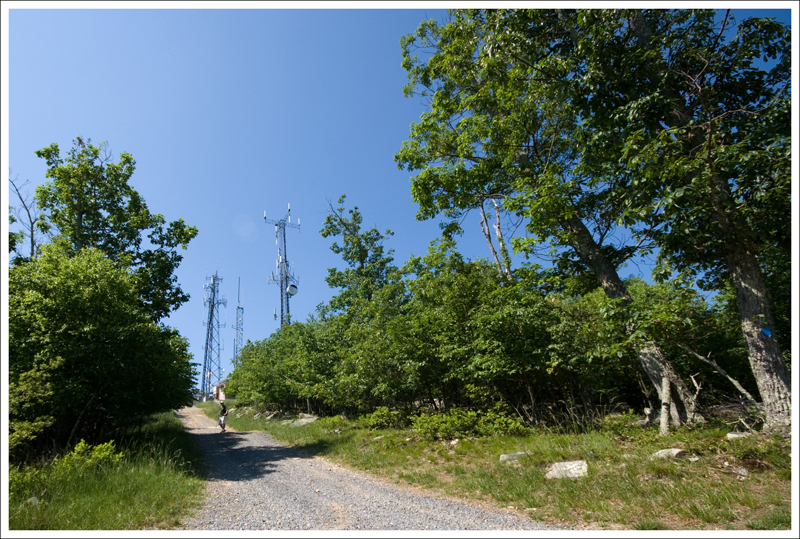 Below: The cell towers on top of Massanutten are a real eyesore; trail markers along the trail are blue and show mileage; for the brave – there is a hang-gliding launch on top Massanutten; the sign shows gliding regulations and disclaimers; the mountain laurel was in full bloom along the trail; at the summit there were many vultures soaring. My favorite part of the hike was the unexpected amount of wildlife we saw along the way. 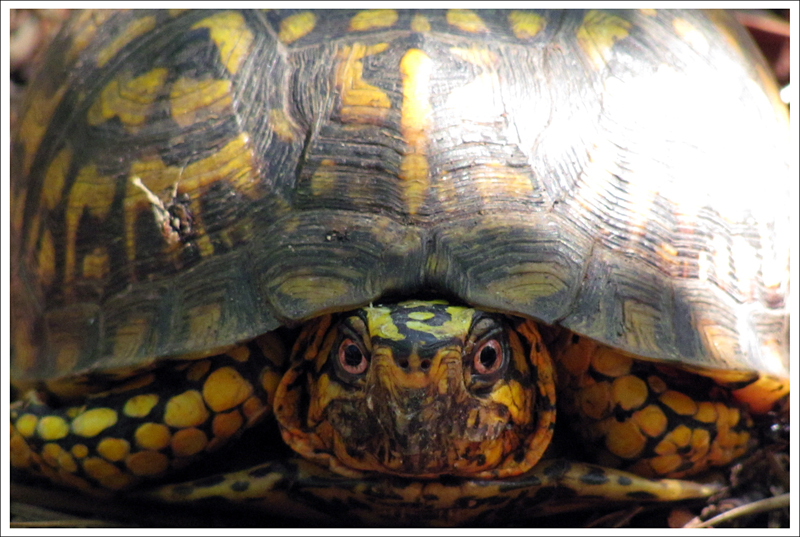 It started off with a cute Box Turtle walking along the trail. 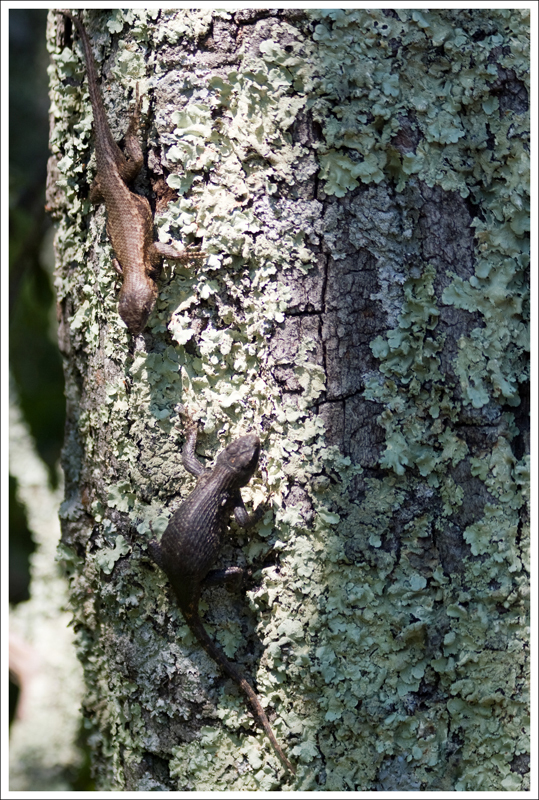 Then we saw numerous Eastern Fence Lizards – two were even participating in a courtship dance. 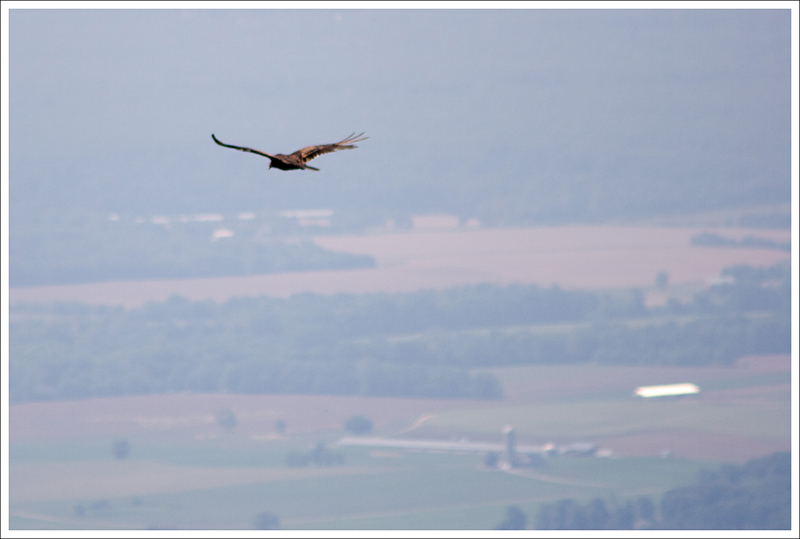 There were lots of butterflies fluttering about and at the overlooks we saw plenty of vultures soaring on the thermals. But the best part was seeing the two goats living at the top of Diamond Jim. I spotted them first through an opening in the woods, and squealed “GOATS!” I couldn’t stop laughing at the way they licked. They went nuts for the salty sweat. We decided to name the goats. 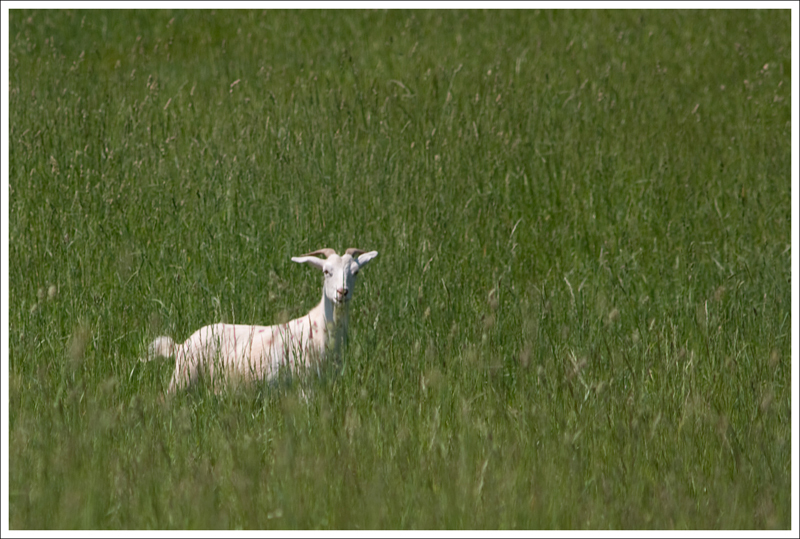 “Diamond” – the white goat – is shy. She follows the other goat everywhere, but does not participate in the vigorous licking. The red and white goat, we decided to name “Salt Lick”. I think the basis of that name is pretty self-evident. All in all, the Massanutten Ridge Trail was a pleasant surprise. The views and the wildlife both far exceeded anything I expected. Difficulty – 4. The elevation doesn’t change a lot initially, but the terrain will make it hard work and slow going. Trail Conditions – 1.5. 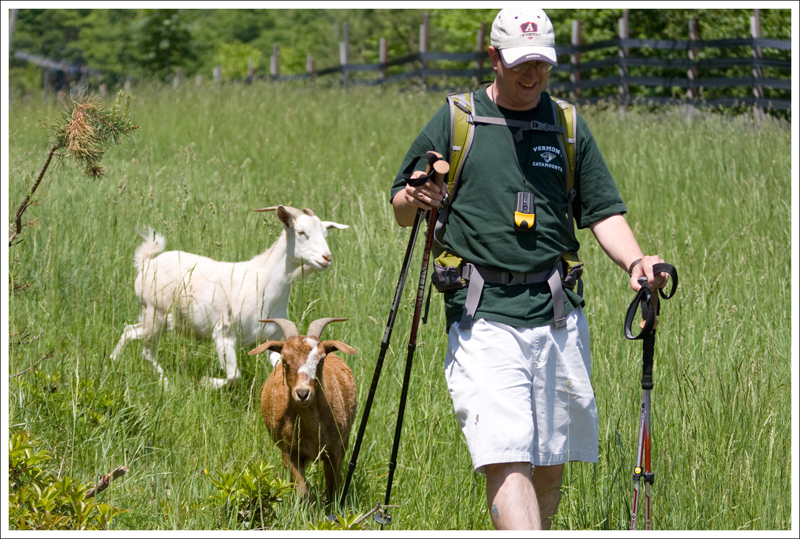 About 1.5 miles of the trail is rocky and then a very steep downhill at the end requires trekking poles to be safest. Views – 4. You get some different views along the way, but the best views are from near the cellphone towers and hang-gliding platform. Wildlife – 4. There aren’t many places you get to see free-ranging goats and I think most people see them here. We also saw lizards and a turtle. Ease to Navigate – 3.5. There was a couple of spots where it was a little difficult to see which way the trail goes, but since you’re on the narrow ridge, it is not hard to just stay on that ridge. Solitude –3.5. We didn’t see anyone there, but you do typically see a lot of people on the initial trail. The people you see will generally be during the first .5 mile. Not many people continue on this trail after that. From Harrisonburg, head east on US 33 for about 10 miles. Turn left at the Exxon on the left and head on SR 644, Resort Drive. Follow this road and take a left on Massanutten Drive. You will reach a guard house. Let the guard know that you are here to hike and they will give you a guest pass. After about 3 miles, take a right on Del Webb Drive. Follow Del Webb Drive for about two miles until you begin to drive up to the ridge, where there is a parking lot on the left. The trail begins up the small, wooden set of stairs leaving the parking lot. I just recently hiked this trail. Your description is full and still accurate. I did not know beforehand how rocky it would be, but I did have good hiking boots. Being the Winter, snakes were not a concern. The views were as good as you would find anywhere in the Valley. Hey all – hope somebody checks in to this and can help me out. I’m hoping you can recall the start of the trail at the Overlook, and after reading the trail notes – I had some questions based on my experience this week, the evening of Aug 24, 2016. I unintentionally had to spend the night on the trail after it got too dark for me to continue, and I’m trying to figure out where I went “wrong”. I also have a question regarding the trail notes – where Christine noted a “0” for waterfalls / streams, which I assume means she didn’t encounter any? The reason I say this is that I encountered the stream quite often and drank from it as I was out of water. ( It was quite good, btw! ). So here goes, and I’m going to describe this the best I can………I for some reason didn’t start where the wooden steps and signs describing the trails were. I spoke to a cyclist who was getting ready to venture out, and the best I can describe it is he went in across from the parking spots circle across the paved road. I was hiking though, not biking fyi. So my start wasn’t far from the wooden steps but it was across the street. Listening to him, he said if I just went in there and just followed what he described as “pink” markings ( I thought they were more red/orange) that it would circle back and I would come out where we started. What I think though was perhaps he was describing was a bike trail and not the hiking trail? So that’s my first question – is there a bike trail that loops around in a circle back to the wooden steps? I thought I was doing that, but I definitely wasn’t. Overall I hiked so long and so far, I’m not exactly sure of the sequence of all that I’m going to describe, but I’ll try. So I was hiking and I believe I was originally following the red tree markings and ended up at a gravel road. 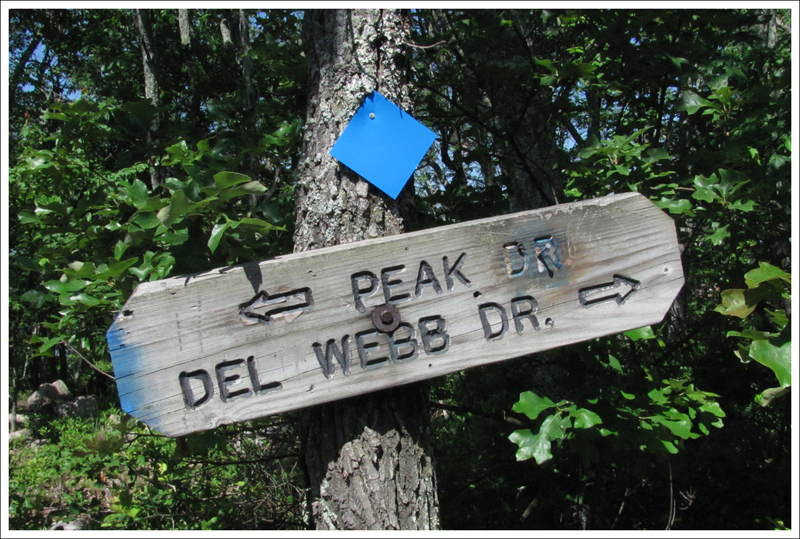 2nd question – I later saw the green signs at the Overlook describing the two trails – both of those trail signs say “blue blaze” on them though. 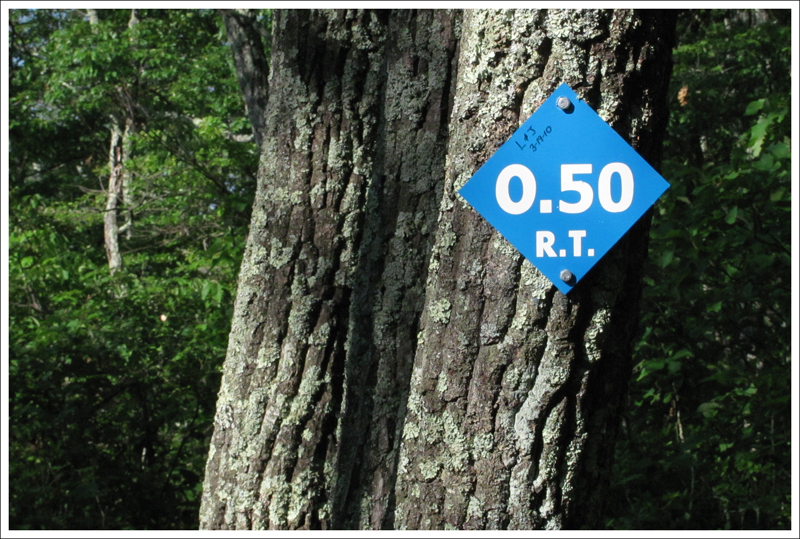 I assume that means blue markings on the trees. I didn’t see anything regarding the “red” markings. So did I just miss that somewhere? Now this whole time I’m thinking I’m supposedly going in a circle, and since the road I drove up on was paved, and this road was gravel, I knew it couldn’t be the road I came in on. At this point I believe I turned around and went back on the trail. I hiked for a long while, I believe still on the red marked trail. So at some point I crossed over a stream over some rocks and came upon some marked trees. Two of the trees has blue markings, and one of them had red. Since I wasn’t having any luck on red, I thought perhaps blue was the “way back” and I started following it. I went for a long long time and was on parts of this path that were literally only about a foot wide. Up, down, rocks and everything. I kept on going and was still thinking this was going to take me back to the start. But it didn’t. At one point I came upon another crossroads. This time there was an altogether different color marking on the trees. I would say it was kind of a light purple.. I did not take the purple path. There were also some wooden signs ( but not the signs in the pictures above ) . One of the signs said something like Cub Run Road ( or something like that ) 1 Mile, and the other said another destination was something like 8 miles! At this point also, the path I took was the widest of anything I’d seen, almost as if it was used by vehicles for a short while, but it then narrowed down again. I walked this path again and saw the red markings. Question 3. Where was I if I saw those purple markings? It got too late and dark and after going a while longer I had to stop as it wasn’t safe for me to see the path. I just sat on the path all night in my shorts and tee shirt. Although I slept very little, I also quite surprisingly heard very little in the way of animal noises other than the constant sound of the birds overhead or whatever was in the trees all night. Luckily also as I sat on the path, there were very few insects and I never encountered any snakes! I think in that respect I was extremely lucky. As it turns out I had traversed basically the entire length of the mountain, probably 1 1/2 to two times the sheriff said, and I was about as far away from the Overlook as possible when I finally came across another gravel road at the bottom of the mountain, some sort of private gravel road,. I came upon a student who camped overnight and helped me out! I was so happy to see him!! So any comments from anyone on my notes above would surely be welcomed! Thank you.! In short, starting across the street instead of at the wooden stairs put you on a completely different trail. If you want to hike the Massanutten Ridge Trail (as outlined in this post), you have to follow the wooden stair up to the trail. The trail on the other side will take you to Kaylor Knob, and eventually (as you found out) Cub Run. Thanks for writing this.. We just finished this hike today not realizing what we were in for.never doing that again next time I will check out the trails first. lol We thought it was a trail that wrapped right around, but good thing a few of our group 0.5 miles in chose to turn around. me and a friend and three kids (11,12,13) laughed and cried and enjoyed the views and want to do it again. Next time we will be prepared with proper shoes and walking sticks. I am really out of shape and over weight and survived it lol the kids did great until the last two miles. Walking down under the ski slopes was the hardest part lol. We didn’t see any goats that would have been nice. Thanks, I know I will be hurting more tomorrow. lol But I look forward to do it again and taking a lunch up there with my husband and other kids. I took lots of pictures but they don’t do it justice. They will have to see it for themselves. 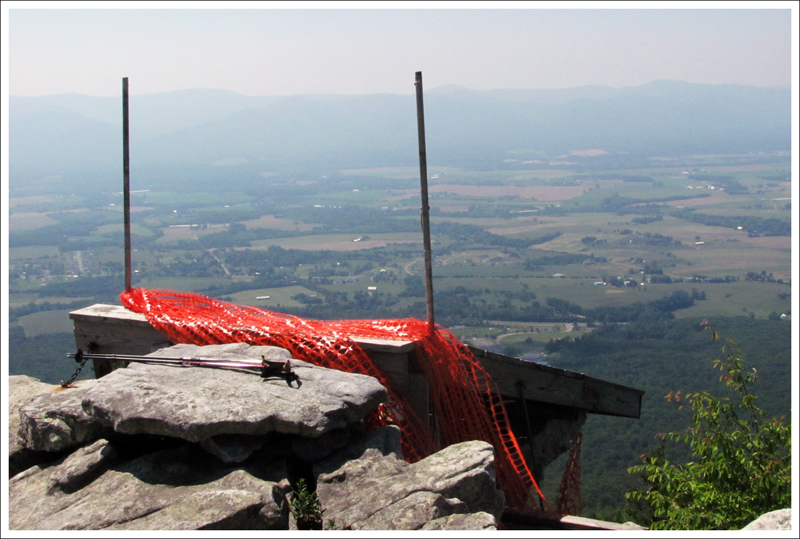 I don’t know of anyplace with a good view of Harrisonburg from above. Sorry! The Massanutten views are a little too far off and facing the wrong direction. Do you think this trail would be okay for a dog? Or do you think the terrain and rock scrambles would prove too difficult? Hi Carissa. I personally wouldn’t take my dogs, but they’re pugs – small and not very athletic. I think a larger, more sporty dog would probably do fine on the trail. There is some rough terrain, but generally there are no sharp drop-offs or dangerous spots (other than the rocky outcroppings at the overlooks). So, I guess my answer is ‘maybe’. Also, just FYI… I’ve heard from recent hikers that the goats aren’t up there this year. Have a good hike! From just coming from this hike, I would not take my dogs up there. It was a hard walk and some very step climbing and scary yet beautiful drop offs. I would be to scared that they would fall or get hurt. but maybe a harness leash on them would be safer but they would still have to big enough to climb or small enough to carry in some spots. good luck and enjoy your hike. Just beware of rattlesnakes (Eastern Diamondbacks) in the area, particularly the Kaylor Knob Trail. 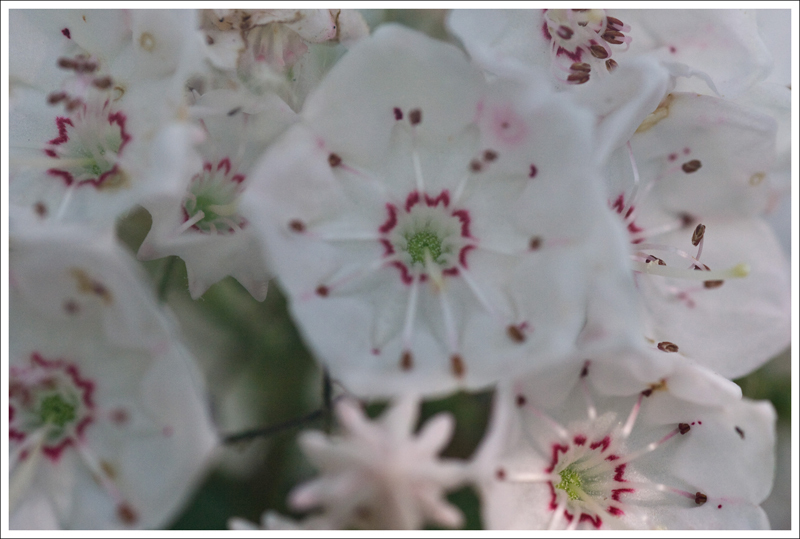 I encountered two on the same hike of the Kaylor Knob Trail last June (2010). Wow – we’ve never seen rattlers on the Kaylor Knob trail! But, a couple summers ago a woman vacationing at Massnutten was bitten by a copperhead walking along that trail.